In some early Greek manuscripts and in the writings of several early Church fathers, the title for the entire composition is the single Greek word praxeis (πράξεις). This is the near equivalent of the English word praxis. The word only occurs six times in the New Testament and is translated variously in the ESV as — “what he has done” (Mat. 16: 27), “their action” (Lk. 23:51), “practices” (Acts 19:18 and Col. 3:9), “the deeds” (Rom. 8:13), and “function” (Rom. 12:4). The word simply means deed, function, action, or practice (whether good or bad). It conveys that something is being done and an action is being carried out. It is doing. As I said, I first learned that the book of Acts was about what the Apostles were doing. Then I learned that – no – it was really about what the Holy Spirit was doing. And as you read the book yourself, you’ll probably discover (as I have) that it is sometimes about what all of the Apostles are doing, or what the Holy Spirit is doing. But it is often also about what the whole church was doing, or what God was doing through Jesus, by the power of the Holy Spirit, in and through the Church. Sometimes it’s primarily about what Peter and Paul were doing with occasional insights into what deacons, evangelists, and various ministry companions were doing along with them. It is also frequently about what various groups were doing in response (for better or for worse) to all of this doing by all of the doers in the book of the doings (praxis). The point is, there is a lot of doing going on in Acts by all of the characters doing things within the narrative. Thanks to an insight from Biblical commentator David Peterson, I believe that there is another “character” in the cast on Luke’s literary stage. There is another doer that is doing and getting things done. And that doer is the Word of God. Acts 13:49 – “And the word of the Lord was spreading throughout the whole region. Unlike the obvious reference in Acts 1:15-16, the word of God in Acts is seldom a reference to the actual text of Scripture, and is likely not what the above texts refer to either. Indeed, it is the proclamation of the living and active word of God by Spirit-emboldened disciples, and the response by those who heard and received the word — the message — that “Jesus is Lord” that sets the trajectory for everything that happens in the book of Acts. In my own life the embrace of the word of God — the good news — that Jesus Christ is Lord, has truly changed, and is still changing everything. 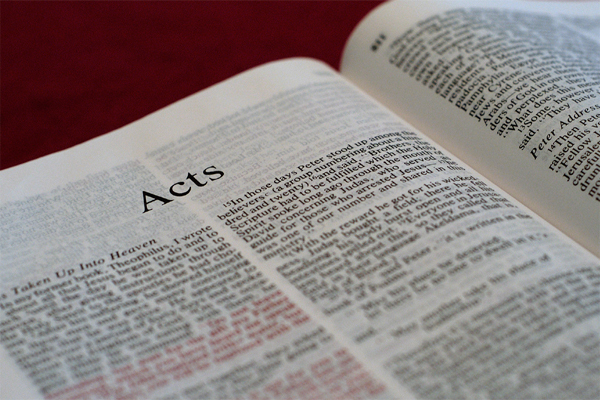 In so many ways, the book of Acts can rightly be called The Acts of the Word of God. cf. Aleph, Origen, Tertullian, Didymus, Hilary, Eusebius, Epiphanius. David G. Peterson, The Acts of the Apostles, The Pillar New Testament Commentary (Grand Rapids, MI; Nottingham, England: William B. Eerdmans Publishing Company, 2009), 48–49. Excellent. Many years ago I did a study of the Word in Acts myself. I think you are on to something here. Happy writing! Thanks very much for this–well done!